January 22, 2016, 4:26 p.m.
One of the more notable moments in the most recent Republican presidential debate came when Ted Cruz attacked Donald Trump for his &apos;New York values&apos;. He attacked New Yorkers&apos; social liberalism and their focus on &apos;money and media&apos;, though Trump responded by noting the way the country rallied around New York after the 9/11 attacks. Cruz was right when he noted that there aren&apos;t many conservatives coming from Manhattan. In the 2012 election, for example, Barack Obama won 81% of the vote in New York City and 84% of the vote in Manhattan specifically. The latest research from YouGov shows that Americans are skeptical of the idea that the values of New Yorkers are worse than the rest of the country&apos;s. 24% of Americans say that New Yorkers have worse values than the rest of the country, 47% say that their values are &apos;as good&apos; and 5% say that New Yorkers have better values. 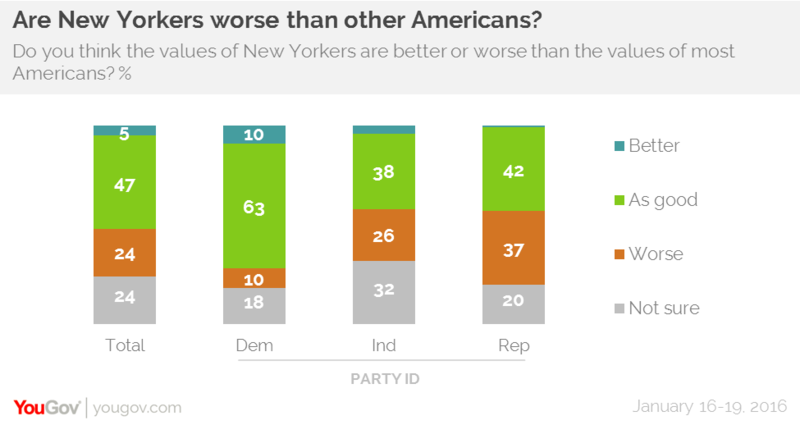 Unsurprisingly there is a partisan dimension to attitudes towards New York values. Republicans (37%) are significantly more likely than Democrats (10%) to say that New Yorkers have worse values than people in the rest of the country, though even Republicans tend to say that New York values are &apos;as good&apos; as everyone else&apos;s (42%). There is one measure on which New York City does fare particularly poorly in the eyes of Republicans, however. Asked what types of areas are the least like &apos;real America&apos; 39% of Americans say that the country&apos;s big cities are the least American places. This is largely a result of Republicans, 58% of whom say that big cities are the least like &apos;real America&apos;. Only 22% of Democrats agree. New Yorkers can sleep easy knowing that not only would most Americans (53%) be sad if the city seceded from the country, but most Americans (56%) also have a favorable opinion of the city. Unsurprisingly favorable opinions of the city are highest in the Northeast (68%), but a majority of people in the South (57%) and the West (55%) also like NYC. Only in the Midwest are favorable opinions of New York not a majority (47%).